Turn your buggy into a rugged and durable shelter on wheels! Use it while driving or to keep your golf cart clean and dry in storage. Before you begin any major adventures in your cart, you need the right equipment and Buggies Unlimited can get you customized and ready to ride! We know there is nothing better than a day on the golf course and we want to make sure you have everything you need to hit the links in style! Here you will find all the items necessary to make your cart the talk of the clubhouse. From bag racks and coolers to club & ball washers and sand & seed bottles. It’s all right here. 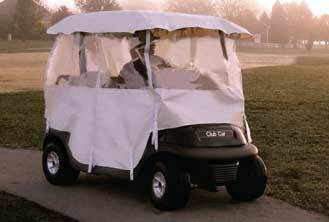 But no golf cart is complete without a cover or enclosure. Don’t let rain get in the way of your day at the course. Our selection of enclosures will ensure that come rain or shine, your cart will be looking great!